Hindi Medium strikes a perfect balance between the academic and the emotional, humorously illustrating how the class system impacts education. While the title refers to the language of instruction — Hindi versus English — the film’s lessons translate internationally. The story is as relevant to America as it is to India, so audiences worldwide can easily connect with the material. Raj (Irrfan Khan) and Mita Batra (Saba Qamar) own a successful bridal store in Delhi’s Chandni Chowk neighborhood. Though they have plenty of money, overprotective Mita worries that their middle-class status will limit future opportunities for their preschool-aged daughter, Pia (cute Dishita Sehgal). Mita convinces her reluctant husband to move to a fancier neighborhood, hoping that will help Pia gain entrance to one of the city’s prestigious elementary schools. While the family has the money to afford their lifestyle upgrade, they lack the cultural and social capital to take advantage of it. Raj’s local tastes in music and food embarrass Mita in front of the Continental types she wants to befriend. Kids ignore Pia because she’s not English-fluent. When the Batras ask the few influential people they do know for help, they’re told that personal recommendations are taboo among this set. Bribery? Don’t even think about it. There are myriad codes and status signifiers that Raj and Mitra don’t know about and have no hope of mastering, even with the help of a professional school-placement coach (Tillotama Shome). On top of that is an absurd layer of bureaucracy instituted by the schools simply because they can. The most damning indictment of the class system is when the coach shares with them a common placement interview question for parents: “How will you introduce the concept of poverty to your child?” The children at these elite schools are so privileged and sheltered that they’ve never encountered a poor person, even in a city as crowded as Delhi. The poor people from a nearby neighborhood already know that the system is rigged against anyone not from the upper crust, something Raj and Mita gradually realize for themselves. The couple finds a loophole when they learn that twenty-five percent of the spots at the elite schools are reserved for economically underprivileged students, who compete for spots via a lottery. The Batras decide to pose as poor temporarily in order to win one of the lottery spots, shifting house once again. Writer-director Saket Chaudhary depicts the Batra’s behavior as reprehensible, but almost logical, using humor to ensure that the audience never loses affection for the characters. The Batra’s economic and social standing puts them in a uniquely desperate situation, especially within India where job inheritance within families is common. They’re successful enough to envision a broader future for their daughter beyond the walls of a Chandi Chowk bridal boutique, but doing so means breaking out of entrenched class hierarchy. Chaudhary deserves kudos for the way he illustrates complex ideas like class and social capital, but particularly so for how he explains the importance of public schools — an ideal that mainstream American conservatives and liberals alike have forgotten, thanks to intense marketing by the for-profit charter school industry. The head of the local government school explains to the Batras that, when middle- and upper-class families put their children in private schools, it deprives the public schools of resources. The director also makes an important point about poverty through the character of Shyam (Deepak Dobriyal), a kind neighbor who helps the Batras adjust to their newly “poor” status. “Living in poverty is an art,” he explains, as he and his wife Tulsi (Swati Das) teach Raj and Mita a whole new set of social skills appropriate for their diminished standing. Shyam insists that the poor don’t want charity, they want their rights. Just using the word “rights” scoffs at the idea that “opportunity” is enough. Hindi Medium falls prey to some of the pitfalls of the Bollywood “issue movie” formula. There’s an awkwardly placed song number that interrupts the build-up to the climax, which is Raj giving a speech that no one has any reason to listen to. Chaudhary tries to invert the cliché with a twist on the requisite audience “slow clap,” but that’s trying to have it both ways. Thanks to his immense talent, Khan comes out of this speech unscathed, the movie cementing his status as the thinking-person’s leading man of choice. Qamar handles Mita’s complexities beautifully, making even her most maddening qualities understandable. Yet another thing director Chaudhary does well is writing every character with their own goals and motivations. Having accomplished performers like Dobriyal and Amrita Singh (as the prep school principal) in supporting roles certainly helps. This entry was posted in Reviews and tagged 2017, 3.5 Stars, Amrita Singh, Bollywood, Deepak Dobriyal, Dishita Sehgal, Hindi, Hindi Medium, Indian, Irrfan Khan, Movie Review, Saba Qamar, Saket Chaudhray, Swati Das, Tillotama Shome on June 11, 2017 by Kathy. Madaari (“The Puppetmaster“) is phony populism at its worst. The entire story hinges on unrealistic assumptions presented in an annoying manner. Man-on-the-street footage is among the laziest of filmmaking cliches because it serves as a form of storytelling peer pressure. The audience is shown that they must feel a certain way because that’s how these hundreds of random, nameless characters feel. It removes the burden from the filmmaker to craft a convincing narrative while simultaneously assuming that the audience wouldn’t be able to understand a convincing narrative even if they saw one. Without man-on-the-street footage, Madaari wouldn’t exist. Time and again, we are presented with montages of nobodies telling the audience how to feel, gathered around screens and nodding in unison. It’s irritating. Take the opening of the film. News channels report that the son of Home Minister Prashant Goswami (Tushar Dalvi) has been kidnapped. An anonymous citizen is so shocked that he nearly drives into oncoming traffic. Cut to a shot of a teenage daughter telling her father that he must have misheard the news, since it would be simply too shocking if the home minister’s son was really kidnapped. The kidnapper in Madaari is Nirmal (Irrfan Khan), who doesn’t demand ransom but rather information about the fate of his own 7-year-old son, Apu. It’s clear from Nirmal’s choice of target that he suspects government corruption is at play. Apparently, much of the public also considers the government corrupt since Nirmal immediately becomes a folk hero. But let’s be clear about this: Nirmal becomes a folk hero for kidnapping a little boy! It’s not enough for the movie to imply that the home minister had it coming (twisted as that would be). The story blames 8-year-old Rohan (Vishesh Bansal) for his own kidnapping because he’s insufficiently Indian. He eschews traditional street food in favor of french fries and drinks bottled water because local tap water makes him sick. As if kidnapping a “foreign” kid is somehow morally justifiable. Let’s reiterate: Rohan is eight. He’s eight! He’s entirely a product of his upbringing and his environment, neither of which he has any control over because he’s a little kid. This is important because, even though Rohan is not in mortal danger early on, Nirmal eventually threatens the boy’s life. Yet that doesn’t change Nirmal’s folk hero status. How is it heroic to threaten to kill a kid? And why should it matter what the public thinks of this guy anyway? Director Nishikant Kamat and writers Ritesh Shah and Shailja Kejriwal overestimate the public’s ability to influence operational decisions in a case like this, pushing the story in a direction that is absurd and stupid. Lead investigator Nachiket (Jimmy Shergill) adopts a wait-and-see strategy as his rescue plan, since the members of Prashant’s party are most concerned about the optics of the situation. “If he can’t protect his own son, how can he protect the nation?” This doesn’t leave much for Shergill to do, an unfortunate victim of the film’s pathologically boring tendencies. When given the opportunity, Khan shows all the skills in his acting arsenal. He’s grounded in his depiction of Nirmal, portraying him as a man shattered but functional. Nirmal’s post-traumatic flashback scenes are more informative and emotionally effective than the news footage Kamat uses as filler. The climax of Madaari is not only unrealistic, it doesn’t satisfy the hunger for social justice the story so desperately tries to stoke. Madaari isn’t even substantial enough to qualify as populist junk food. This entry was posted in Reviews and tagged 1 Star, 2016, Bollywood, Hindi, Indian, Irrfan Khan, Jimmy Shergill, Madaari, Movie Review, Nishikant Kamat, Ritesh Shah, Shailja Kejriwal, The Puppetmaster, Tushar Dalvi, Vishesh Bansal on July 22, 2016 by Kathy. *Author’s note: Though this film is based on a true story, I reviewed the film as a stand-alone piece of art, not as a referendum on the 2008 Noida double murder case. A candlelight vigil is held following a teenage girl’s murder, protesters holding signs demanding justice for the victim. 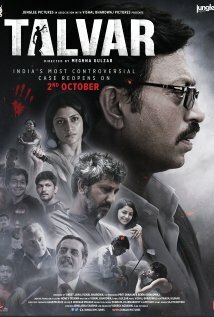 Director Meghna Gulzar and writer Vishal Bhardwaj highlight the subjective natures of truth and justice in the hypnotic mystery Talvar (international title: “Guilty“). The girl is 14-year-old Shruti Tandon (Ayesha Parveen), found dead in her bedroom by her parents, who apparently slept through their daughter’s murder. Shruti’s father, Ramesh (Neeraj Kabi), and mother, Nutan (Konkona Sen Sharma), fall under suspicion after the original suspect — a servant named Khempal — is found murdered on the roof of their apartment building. The initial police investigation is a calamity. Neighbors and detectives wander obliviously through the family’s apartment, contaminating the crime scene. Officers neglect to preserve crucial evidence because they are busy taking photos of each other next to the body on the roof. With the most obvious suspect exonerated by virtue of his being dead, the police invent outlandish theories to establish the guilt of the parents. They rely heavily on the testimony of Ramesh’s employee, Kanhaiya (Sumit Gulati), who has a grudge against his boss. At the press conference announcing formal charges against the Tandons, the police chief mispronounces Shruti’s name and assassinates her character. The chief accuses Ramesh of wife-swapping, adding, “He is as characterless as his daughter was.” Embarrassed by the conduct of the police, the government turns the case over to the Central Department of Investigation (CDI), handing the reins to officer Ashwin Kumar (Irrfan Khan). As new theories of the crime are introduced, Gulzar reenacts each version as though it were true. Ramesh and Nutan are shown as either savvy killers or grief-stricken parents, depending on who is telling the tale. The technique is integrated seamlessly into the narrative of the investigation, which changes hands three times. That means that Shruti’s death is shown over and over again, in gory detail. Even though the investigation is the focus of the story, the audience is never allowed to forget the two deaths that started it. The point of Talvar is not so much to establish the truth of what happened — a fact made extraordinarily difficult thanks to the botched initial investigation — but the multiple ways that evidence can be interpreted. The different conclusions reached by the police, Ashwin, and his successor Paul (Atul Kumar), reveal as much about the investigators as they do about the crime itself. Gulzar maintains the gravity of the story with sparing use of background music (also written by Bhardwaj). Uncomfortable interrogations are made even more uncomfortable without the distraction of a musical score. Gulzar also coaxes great performances from her cast, especially Kabi, Sharma, and Gulati, who have to act in the present day storyline as well as the reenactments of the murder. Irrfan Khan is amazing, with Ashwin standing in for the audience as the objective observer. Well, as objective as Ashwin can be whilst being pressured into a divorce by his wife, Reemu (Tabu). The divorce subplot again highlights that the participants are human beings, not crime-solving robots. Same for the detail about Paul bringing his son with him to the crime scene because he can’t find a babysitter. Talvar is an engrossing police procedural full of humanity. It’s both a joy and a nightmare to watch, knowing that the story is based on a real incident. Gulzar’s direction is tense, but never exploitative. This is a terrific film. 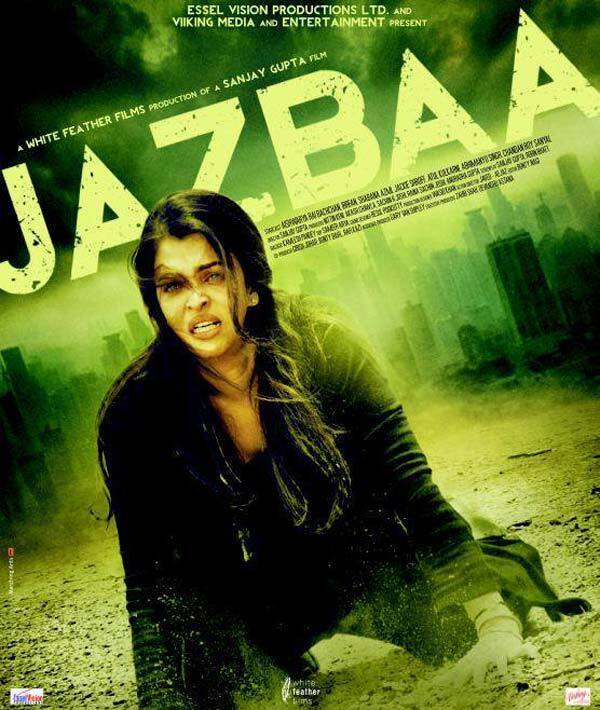 This entry was posted in Reviews and tagged 2008 Noida double murder case, 2015, 4 Stars, Atul Kumar, Ayesha Parveen, Bollywood, Guilty, Hindi, Indian, Irrfan Khan, Konkona Sen Sharma, Meghna Gulzar, Movie Review, Neeraj Kabi, Sumit Gulati, Tabu, Talvar, Vishal Bhardwaj on October 8, 2015 by Kathy. Rather than the broad, scatological comedy hinted at by the movie’s trailers, Piku is a thoughtful, funny movie about the fraught relationship between an adult children and their ailing, aging parents. Director Shoojit Sircar and screenwriter Juhi Chaturvedi are proving to be Bollywood’s most interesting behind-the-scenes partnership. 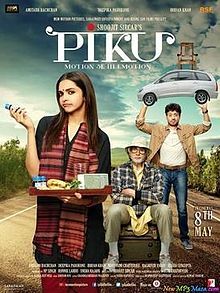 Following their surprise hit debut Vicky Donor and the somber war film Madras Cafe (for which Chaturvedi wrote the dialogue), Piku is the duo’s most refined work yet. Deepika Padukone plays Piku, a 30-year-old Delhi architect who doubles as caretaker for her ailing 70-year-old father, Bhaskor (Amitabh Bachchan). Piku’s mother is dead, and the only help she has in caring for cranky Bhaskor is the patient servant Budhan (Balendra Singh). Piku is a carbon copy of her dad. Both are intelligent and confident, but also stubborn, opinionated, critical, and unable to admit mistakes. Bhaskor’s blindness to his own failings is particularly troublesome. On principle, he refuses to let Piku marry, lest she waste her intellect as a stay-at-home wife. However, he sees no hypocrisy in calling her home from the office every time he imagines a rise in his blood pressure or temperature. Their relationship is the focus of the entire film, and there isn’t a lot of action, even when father, daughter, and servant hit the road to visit the family home in Kolkata. The owner of a taxi service, Rana (Irrfan Khan), gets to observe and comment on the family dynamic when pressed into driving them on their 1,500 km journey. Where Piku differs from many other films about family relationships is that it eschews broad themes. There are no speeches or generalizing statements about love, the importance of family, or the challenges of aging. Piku and Bhaskor don’t learn from each other or Rana; they don’t evolve. The characters in the film are who they are, and they all know it. Bhaskor and Piku argue without creating permanent rifts. Detailed discussions of medical conditions devolve into laughter. This is a movie about accepting life as it is, making it work, and finding humor in odd places. It’s a joy to watch the actors portray fully developed characters with such honesty, and Sircar allows the performances to shine. Instead of cutting between closeups of individual actor’s faces as one delivers a line and another reacts, Sircar shoots most of the film’s conversations so that all the actors’ faces are within the frame, simultaneously. When Bhaskor says something ridiculous, we see Piku and Rana look at each other and stifle giggles in real time, all while Budhan naps in the background. The superb performances are further confirmation of the cast members’ immense talents. Bachchan highlights the absurdities inherent in Bhaskor without making him into a joke. Khan brings warmth and perspective into the story through Rana. Piku teeters on the brink of unlikability without falling off, thanks to Padukone. The character is a woman whose reserve of patience has been exhausted by her father, and she doesn’t suffer anyone who makes her life harder than it already is. The qualities that make her difficult are the same that make her endearing. She wins over Rana with her wisdom and sharp humor. Rana and Piku don’t have a typical, dramatic Bollywood love story, but it’s romantic nonetheless. For two hard-headed single people with demanding families and jobs, more drama is the last thing they want. An allegiance based on understanding and compassion is much sweeter and more satisfying. While the film’s trailer is full of references to bowel movements, they don’t dominate the movie. There’s one visual gag — in which a sink clogged by tea leaves is meant to evoke images of something more disgusting — that should’ve been left out. The movie is too clever for such a cheap joke. Sircar and Chaturvedi show a real understanding of the emotional complexities of the parent-child relationship as it shifts over time, and the cast is the perfect group of actors to bring the story to life. Piku is really something special. This entry was posted in Reviews and tagged 2015, 3.5 Stars, Amitabh Bachchan, Balendra Singh, Bollywood, Comedy, Deepika Padukone, Hindi, Indian, Irrfan Khan, Juhi Chaturvedi, Movie Review, Piku, Shoojit Sircar on May 13, 2015 by Kathy. One new Hindi movie opens in the Chicago area on May 8, 2015. Piku stars Amitabh Bachchan and Deepika Padukone as a father and daughter on a road trip, chauffeured by Irrfan Khan. Piku opens on Friday at the AMC River East 21 in Chicago, Regal Gardens Stadium 1-6 in Skokie, MovieMax Cinemas in Niles, AMC South Barrington 30 in South Barrington, Regal Cantera Stadium 17 in Warrenville, and AMC Loews Woodridge 18 in Woodridge. It has a listed runtime of 2 hrs. 15 min. Gabbar is Back gets a second weekend at all of the above theaters except the River East 21. Other Indian movies showing in the Chicago area this weekend include Uttama Villain (Tamil w/English subtitles) at the Muvico Rosemont 18 in Rosemont, Cinemark at Seven Bridges in Woodridge, and MovieMax, which also carries the Telugu version of Uttama Villain, India Pakistan (Tamil), Bhaskar the Rascal (Malayalam), Oru Vadakkan Selfie (Malayalam), OK Kanmani (Tamil), OK Bangaram (Telugu), and S/O Satyamurthy (Telugu). This entry was posted in Weekly Theater Updates and tagged 2015, Amitabh Bachchan, Bollywood, Chicago, Deepika Padukone, Friday, Gabbar is Back, Hindi, Indian, Irrfan Khan, Malayalam, May 8, Movie, Niles, Piku, Runtime, Skokie, South Barrington, Tamil, Telugu, Trailer, Warrenville, Woodridge on May 6, 2015 by Kathy.